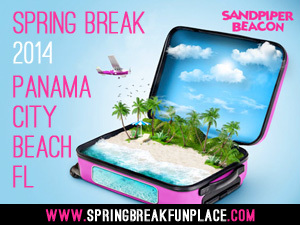 Book your Spring Break 2014 holiday with The Sandpiper Beacon Beach Resort! Collegiate Marketing Group has successfully been promoting and coordinating the greatest Spring Break experience in Panama City Beach, Florida since 2010. CMG’s key strategies have always been to partner with the best in the industry in order to enhance brand awareness, create product loyalties, and engage consumers. This is evidenced year after year with the promotion of the North American rite of passage; Spring Break in Panama City Beach FL. One of CMG’s key partners in Panama City Beach FL, during Spring Break is the Sandpiper Beacon Beach Resort. A uniquely equipped beachfront hotel & resort, with an on-site Tiki Bar right on the beach. The Sandpiper Beacon is a fun, family-friendly resort year round, but shifts gears during Spring Break to specifically cater to the thousands of College & High School Students CMG brings to the “World’s Most Beautiful Beaches”. “We are proud to have been partners with CMG since day one, and couldn’t imagine a better coordinated or more consistent management of the entire event” said Patrick Hazard, General Manager of the Sandpiper.